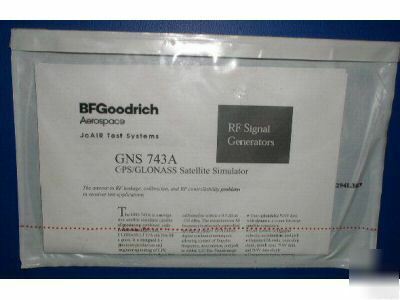 The GNS 743A is a navigation satellite simulator capable of producing combined, code-synchronized GPS and GLONASS L1 C/A satellite RF signals. It is designed for precision production and engineering testing of GPS receivers, particularly those that must meet exacting certification requirements. Carrier-to-noise ratio, acquisition and tracking tests, pseudo-range measurements, inter-channel bias, and almanac downloading can be accomplished readily and cost effectively with this unit. Completely programmable for automated production testing, it is available in a single channel or a dual channel configuration. 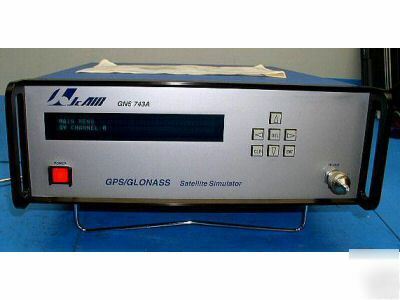 The dual channel version (GNS 743A-2L) can simulate any combination of two GPS and/or GLONASS space vehicles. 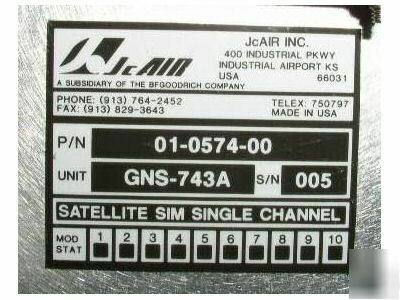 Each channel can be independently configured as a GPS or a GLONASS space vehicle. The RF signals are summed and output to a single RF port. The design of the GNS 743A has produced a very low noise RF output with negligible RF leakage, enabling the output level to be held within ±1 dB down to -158 dBm. It is calibrated to within ± 0.5 dB at -130 dBm. 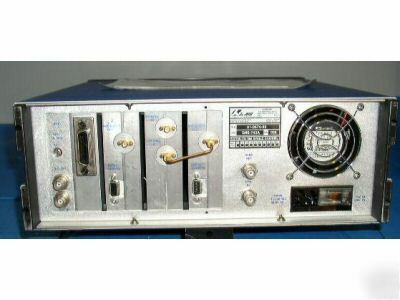 The instantaneous RF frequency is precisely controlled through advanced DDS (direct digital synthesis) techniques, allowing control of Doppler frequency, acceleration, and jerk to within 0.01 Hz. Pseudorange measurements are facilitated by the ability to enter, to within 1 ns, the delay of the C/A epoch relative to an internally generated or externally supplied 1 PPS sync pulse. Comprehensive calibration procedures, traceable to NIST, are provided in the maintenance manual (not provided). This item powered up when plugged in and appears to function as we would expect. We will send the unit out for calibration after completion of the sale. We will guarantee calibration or refund the full purchase price. For all questions please contact Robert Brams .